Provides two replacement units for a small additional charge in one year and covers kinds of accidents, such as water damage and collisions, giving you peace of mind. Activated less than 48 hours. Aircraft approved via video verification. 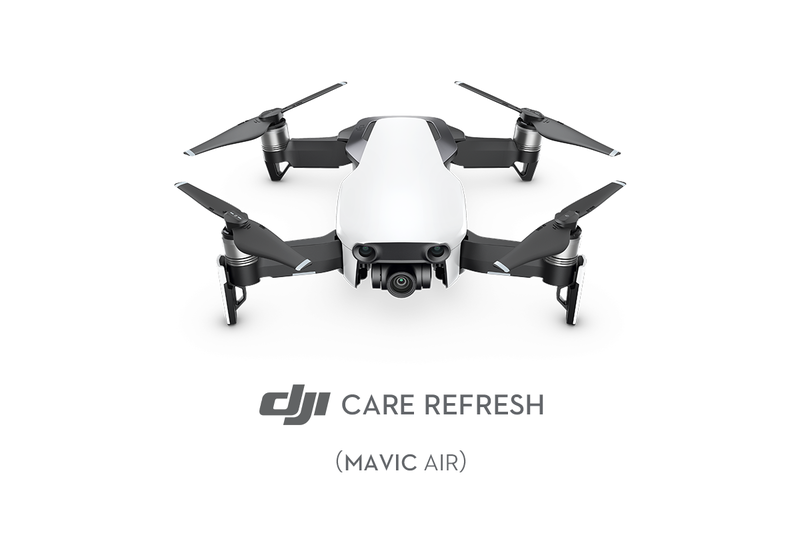 What is DJI Care Refresh? Does DJI Care have deductibles? No, DJI Care does not have deductibles. It is an aircraft repair service, rather than an insurance service, meaning your aircraft will always be repaired for free as long as repair cost and aircraft condition satisfies DJI Care coverage requirements. If I have DJI Care, do I have to pay repair costs before applying to DJI Care for reimbursement? No. DJI Care is bound to the S/N of your aircraft, meaning repair costs will automatically be deducted from your DJI Care coverage amount. No additional payment is required. If my aircraft is within the Factory Guarantee, will repairs be deducted from my DJI Care coverage amount? If aircraft repairs satisfy Factory Guarantee conditions, repair costs will be paid by DJI without deduction from the DJI Care coverage amount. How long after purchase does DJI Care become valid? DJI Care is valid immediately after purchase when bought separately. When purchased with a brand-new aircraft, DJI Care will be valid from two days after aircraft shipment. What’s the difference between DJI Care and a DJI product warranty? Will a DJI product warranty be invalid without purchasing DJI Care? A product warranty is a repair service provided by a manufacturer when product quality problems occur. DJI Care is a service plan that provides you with peace of mind, covering damage to your DJI aircraft, gimbal or camera sustained during normal use. Although you can still enjoy DJI’s standard product warranty without buying DJI Care, a DJI Care service plan can greatly reduce repair costs. Furthermore, if the repair costs are covered by a standard product warranty, the remaining balance on your DJI Care Service Plan will not be affected. What is covered by DJI Care? DJI Care covers damage to the aircraft, gimbal or camera due to dropping, squeezing or crashing caused by operator error or other accidents. DJI will offer free repairs if the equipment is sent to DJI within the period of validity. Accessories such as remote controller, propellers, battery and charger will not be covered by DJI Care. How long is DJI Care valid for? DJI Care is valid for one year. If you buy DJI Care separately (i.e. after purchasing the aircraft), the period of validity begins from the date of purchase. If you buy DJI Care with a new aircraft, the period of validity begins two days after the aircraft is shipped. Please refer to the period of validity noted on your DJI Care Service Agreement for details. Can I renew my DJI Care service plan when it expires? How many times can I purchase DJI Care for my aircraft? No, you cannot. Currently, each aircraft is eligible for only one DJI Care service plan. The service plan cannot be renewed after it expires. Is the DJI Care service plan bound to the original aircraft owner who purchased the plan? No, it isn’t. The aircraft owner can be changed but the S/N of the aircraft bound to the service agreement cannot. What conditions are not covered by DJI Care? 1)	Lost or partially lost aircraft and accessories. 2)	Stolen or abandoned aircraft and accessories. 3)	Damage caused by flight under unsuitable flight conditions. 4)	Any repair fees resulting from or following water damage. 5)	Repair fees for battery, propellers, remote controller or other accessories. 7)	Abrasions and shell damage that do not affect the performance of the aircraft. 8)	Direct or indirect losses caused by force majeure. 9)	Repair requests for damage incurred outside the period of validity. 10)	Indirect loss and/or anticipated profit in any form. 11)	Extra fees resulting from technical enhancements or performance improvements. 12)	Personal injury and/or property loss to the customer or any other people caused by the aircraft. 13)	Any legal fees related to DJI Care’s warranty coverage. For a small additional charge, DJI Care Refresh offers up to two replacement units within one year. Each time you request a replacement, you’ll receive a replacement unit that is new or equivalent to new in performance and reliability. DJI will cover shipping fees only in the country or region where DJI Care Refresh was purchased. Otherwise, the customer will bear responsibility any shipping and customs fees caused by sending the product from another region. DJI has the right to refuse service in this circumstance. For the Mavic series and Spark, the aircraft, gimbal, camera, battery and propellers can be replaced. For the Phantom 4 Pro, Phantom 4 Advanced, and Phantom 3 SE, the aircraft, gimbal, camera, and propellers can be replaced. For the Inspire 2, the aircraft and propellers can be replaced. For the Zenmuse X4S ,X5S and X7, the gimbal and camera( including lens) can be replaced. 1. Lost or partially lost aircraft, gimbal or accessories. 2. Stolen, forgotten, or abandoned product. 3. Damage caused by flight under unsuitable conditions. 4. Remote controller, battery of Inspire 2, Phantom 4 Pro and Phantom 4 Advanced, and modification accessories. 6. Abrasions and shell damage that do not affect the performance of the product. 7. Direct or indirect losses caused by force majeure. 8. Replacement requests for damage incurred outside the period of validity. 9. Extra fees resulting from technical enhancements or performance improvements. 10. Damage resulting from modifications that are not in accordance with manual recommendations, or the use of incompatible batteries and charger. 11. Damage resulting from the use of third party accessories, batteries or software. DJI Care Refresh includes two replacements. If you claim for replacement of your product twice, DJI shall be considered to have fully executed the DJI Care Refresh service. The DJI Care Refresh service will then be terminated. After replacement, the original product becomes DJI’s property and the replacement product is your property, with coverage effective for the remaining period of the Plan. DJI Care Refresh is valid for 12 months. If you purchase a product with DJI Care Refresh on the official DJI website, it shall take effect on the third day after the date of shipment. If you buy DJI Care Refresh separately on the official DJI website or via other channels, it shall be effective from the date on the service agreement. 1. If damage to your DJI product occurs and you are within DJI Care Refresh coverage, contact DJI Support via http://www.dji.com/support, TEL and ONLINE SUPPORT are preferred. 2. Send your product (including the aircraft, gimbal, propellers and battery) based on the DJI Care Refresh warranty plan you have purchased to a DJI designated repair center under the instruction of DJI Support. If you purchase DJI Care Refresh (Inspire 2), send the aircraft and propellers. If you purchase DJI Care Refresh (X4S/X5S/X7), send X4S /X5S/X7 gimbal( including lens). If you purchase DJI Care Refresh (Phantom 4 Pro, Phantom 4 Advanced and Phantom 3 SE), send the aircraft, gimbal, camera, and propellers. If you purchase DJI Care Refresh (Mavic series and Spark), send the aircraft, gimbal, camera and propellers. In order to shorten logistics time, please do not send back the battery if it works well. If you do not send the required part(s), DJI may require you to send it (them) again or decline your replacement request. 3. DO NOT return the remote controller. You will be required to undertake any fees incurred from returning the remote controller. 4. DJI Care Refresh provides up to two replacements for your drone. For each replacement service, DJI Care Refresh for the Mavic series and Spark covers only one battery replacement. Please do not send additional batteries or accessories. Otherwise, the customer will be responsible for any related shipping and handling fees. 5. If damage to your aircraft occurs and you are within DJI Care Refresh’s coverage, you will receive a quotation about repair fees. You can choose to pay for repair or replace your aircraft. For replacement services, an additional fee will be charged. After the payment is confirmed, DJI will send the replacement to you. 1. The service has expired. 2. Your DJI product was repaired by a non-official DJI repair center. 3. DJI Care Refresh includes two replacements. If you claim for replacement of your product twice, DJI shall be considered to have fully executed the DJI Care Refresh service. The DJI Care Refresh service will then be terminated. 4. If the customer is found to have broken a DJI Care Refresh covered product on purpose, the service will be terminated automatically, and DJI will not offer a refund. If a customer is found to be causing accidents for financial gain, DJI reserves the right to take legal action. There are no hidden charges for the replacement service. After you choose DJI Care Refresh, you will receive prioritized service. The cost of two way postage for customers within DJI Care Refresh service areas will be covered by DJI. In other areas, these costs and any associated customer’s duties are at the customer’s expense. In all areas the custom fees are at the customer’s expense. Each time the replacement service is requested, subject to your purchase region. For DJI Care Refresh (Spark), the first time replacement fee is AUD $79, the second time replacement fee is AUD $99. For DJI Care Refresh Mavic Pro/Mavic Pro Alpine White), the first time replacement fee is AUD $139 , the second time replacement fee is AUD $199. For DJI Care Refresh (Mavic Pro Platinum), the first time replacement fee is AUD $159 , the second time replacement fee is AUD $229. For DJI Care Refresh (Mavic Air), the first time replacement fee is AUD $129 , the second time replacement fee is AUD $169. For DJI Care Refresh (Inspire 2), the first time replacement fee is AUD $369, the second time replacement fee is AUD $579. For DJI Care Refresh (X4S), the first time replacement fee is AUD $79, the second time replacement fee is AUD $119. For DJI Care Refresh (X5S), the first time replacement fee is AUD $269, the second time replacement fee is AUD $399. For DJI Care Refresh (X7), the first time replacement fee is AUD $649 , the second time replacement fee is AUD $849. For DJI Care Refresh (Phantom 4 Pro), the first time replacement fee is AUD $209, the second time replacement fee is AUD $319. For DJI Care Refresh (Phantom 4 Advanced), the first time replacement fee is AUD 189, the second time replacement fee is AUD 269. 1. DJI Care Refresh can be cancelled upon return of the product purchased, according to DJI refund policies. 2. DJI Care Refresh cannot be cancelled without returning the product purchased. 3. DJI Care Refresh cannot be transferred after purchase. Please do NOT send SD cards to DJI. DJI shall not be responsible for any damage or loss to the data or personal information stored or saved in your product.